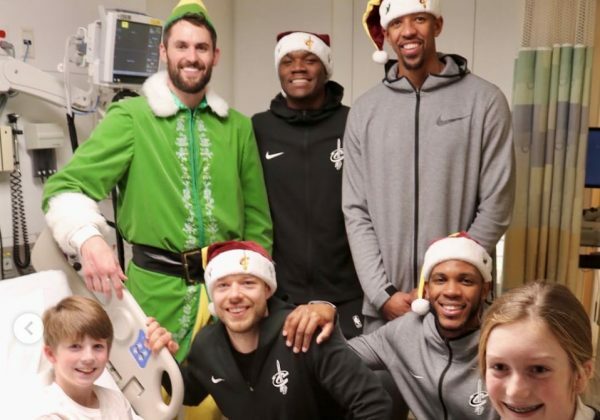 Children at the Cleveland Clinic Children’s Hospital were surprised Thursday by a visit from Buddy the Elf and his friends, the entire roster of the Cleveland Cavaliers. Actually, Buddy was Cavs forward Kevin Love dressed up as the character from the 2003 film. Regardless of whether the children would have rather had a visit from Love or from an elf famed for his holiday cheer, the moment probably brought a burst of joy to their day. Love was accompanied by the entire Cavs roster. The Cavaliers went from room to room, bringing presents and smiles with them. 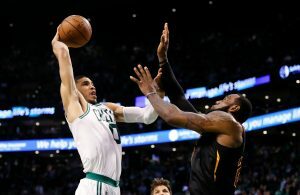 As an important component of the Big 3, who in 2016 brought Cleveland its first sports championship in decades, Love remains a popular figure in Cleveland. Unfortunately, the UCLA grad has been unable to contribute recently to the struggling Cavs, as he is out with a toe injury and likely will not make it back into the lineup until January. But even when he’s not playing, the 11th-year veteran can still give back to the Cleveland community. A visit from an NBA superstar — or Buddy the Elf — and the rest of the Cavs could make all the difference for a child. For more official photos of the Cavs’ visit, click here. 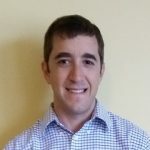 Dan is a freelance writer, a lifelong fan of the NBA and an aficionado of Cleveland sports.